Daniel Evans, artistic director of CFT and director of this show, knows how to stage a spectacle and he’s in fine form with this one which could, I suspect, be Chichester’s next West End transfer. Me and My Girl is a gloriously old fashioned, feel good musical dating from 1937. 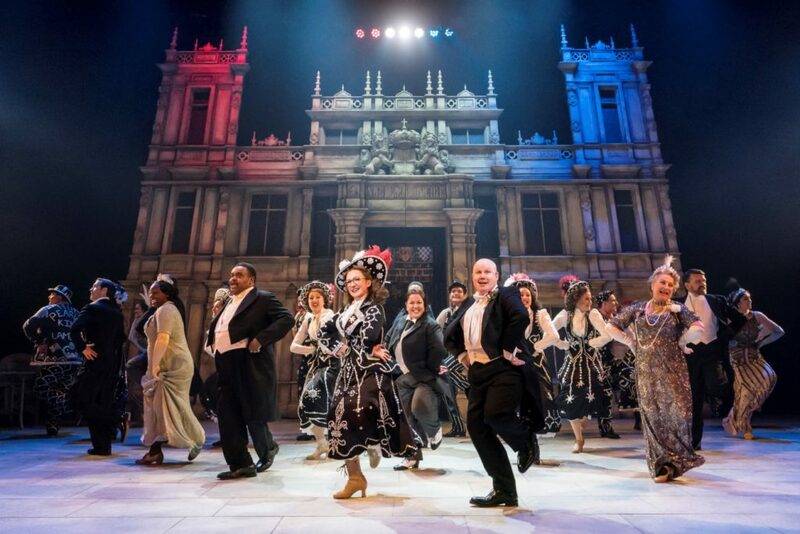 Like so many of the best British comedies it’s a play on social class with more than a whiff of both Pygmalion/My Fair Lady, Kind Hearts and Coronets and HMS Pinafore which is substantially referenced in Mark Cumberland’s sparky orchestrations of Noel Gay’s score. Matt Lucas plays Bill Snibson, the gor-blimey, punning Lambeth chap who suddenly finds he’s inherited a pile and a fortune. But on press night he was indisposed so we got show stealing Ryan Pidgen – warm, confident, accomplished and well deserving of his standing ovation. Caroline Quentin delights as Maria, Duchess of Dene. She flounces, frightens and fulminates in a fabulously frumpy tweed skirt until the very end when, Katisha-like she succumbs to the charms of her old friend Sir John Tremayne (Clive Rowe – engaging). As her glittering daughter, Siubhan Harrison flirts, swarms and there’s a very polished, make-you-gasp dance scene with a group of men in which she is thrown into all manner of unlikely poses. And there’s splendid work from Alex Young as Snibson’s titular “my girl” from Lambeth who really isn’t very likely to fit in as Lady Hareford. In her woollen beret and spectacles she initially presents a homely figure who can also sing and dance “to the manor born” – as it were. But the real star of this tuneful, uplifting show is the ensemble who drive the piece along with energy and panache – assisted by choreographic strokes (by Alistair David) of witty genius such as suits of armour which tap dance and a tango with beach towels. The big set pieces such as Doing the Lambeth Walk and The Sun Has Got His Hat On are gloriously vibrant too.